The team at La Crescent Animal Care is comprised of highly trained and experienced animal health professionals who have a genuine love for working with pets. Our staff treats every patient with the highest quality of medical care as well as a gentle touch. I graduated from the University of Minnesota College of Veterinary Medicine in 1983 and moved back to my hometown of Caledonia, MN in 1984. 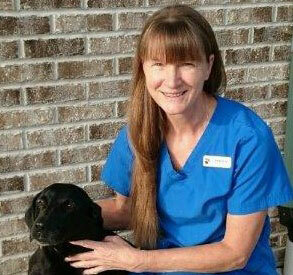 La Crescent Animal Care was started in 1997 as a part time satellite of the Caledonia Veterinary Service. In 2005 we moved into the present building which was originally built as an Amish furniture store. The Caledonia practice was sold to an associate in 2010 since La Crescent Animal Care was growing so rapidly. My professional interests are in surgery and dentistry. I am very proud of the talented group of individuals we have assembled and the high level of care that they provide to our furry friends. My name is Dr. Christina O’Neill and I was born, raised and educated in Minnesota. I currently reside across the river in Packer territory, but hold true to my Minnesota roots. I am married and have 3 children, a beloved Golden Retriever and a calico cat to keep me company. In my spare time, I enjoy hiking, biking, canoeing, camping and staying active with my family. Being a veterinarian allows me to work with animals and animal lovers every day, and I enjoy getting to know my patients and their families. I was raised in a town in Southern Illinois called Metropolis, the home of Superman. I had wanted to be a veterinarian since I was in the 7th grade. I went to college down south at Mississippi State University. I was there for 7 years for undergrad and vet school. There I met my wonderful fiancé who’s a Wisconsin native. Once I graduated, I moved up to La Crosse Wisconsin where she works. We have a Bagle (Basset Hound/Beagle Mix) named Rudy and a Great Dane named Dorothy. I enjoy getting to work interesting cases plus meeting great clients and their pets. I’ve always had pets, from BlackLabs to Great Danes, bunny rabbits to horses; numerous barn cats “smuggled” into the house; and even a pet goat. I graduated from the University of Minnesota College of Veterinary Medicine in 1979 and was in private practice for several years. Life took a turn as I pursued a doctorate in theology and spent over 10 years on the mission field. Most of my time was in Africa, with the last five years dodging bombs and bullets, mortar shells and landmines in the midst of the civil war in Southern Sudan. After returning to the United States, I taught for 8 years in the Vet Tech program at a career college in the Twin Cities. I am blessed to be a part of the awesome team at La Crescent Animal Care and look forward to meeting you and your “furry families”. I grew up in Appleton, WI and moved to Brownsville with my husband. We have lived here for over 30 years and enjoy the area. I have a daughter and 2 grandchildren, My love for animals has provided me with many opportunities to work with pets and their owners. I enjoy working in all areas of the clinic. My work includes grooming, reception, and management. My dog Sadie, enjoys visiting the clinic occasionally to keep Nosey company! I have worked in pet care for over 30 years. 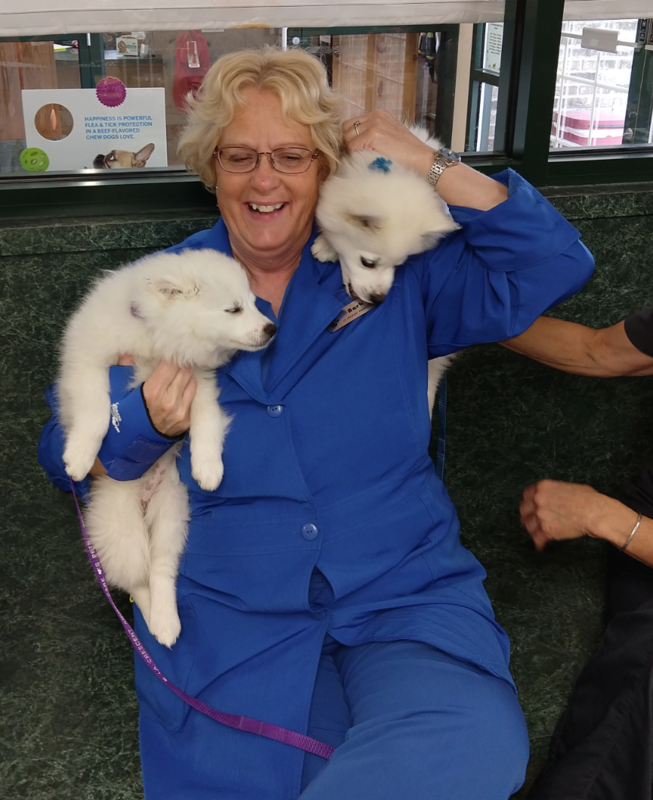 "I just love people and pets and enjoy my role as Receptionist with the Team at La Crescent Animal Care. 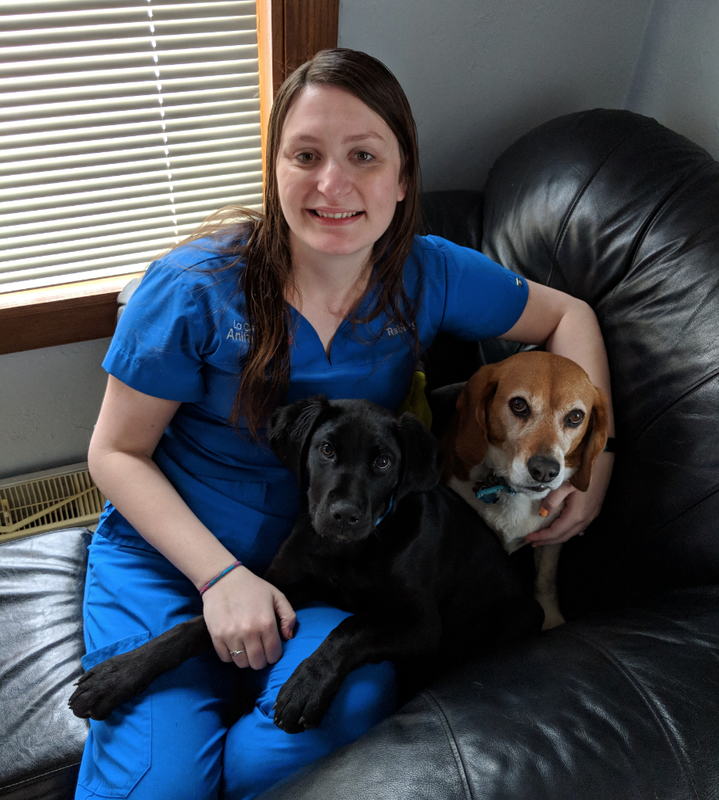 They have cared for our family pets so wonderfully,“ says April, who is glad to be back working in the La Crescent community she was raised in and in which she raised her son and daughter, Sterling and Sierra. I moved to the La Crosse area from Eau Claire in the spring of 2012 just before my son was born. I currently live in Holmen with my Husband, two children Caleb and Isabelle, two cats and a very energetic puppy. I love being able to see the variety of animals that come in everyday. I am a proud mom of 4 fur babies, 2 dogs and 2 cats. I have worked in the veterinary field for over 10 years. I started off working for SPCA of Texas doing animal rescues and soon left to work for a private veterinary clinic. I love working with animals, it fills my heart with so much love. I grew up in the Chicago area, graduated from the College of St. Benedict in St. Joseph, MN and made my way south to be closer to my family in Illinois. I ended up in La Crescent, MN for 27 years until the summer of 2015 when I moved to La Crosse, WI. I have 3 wonderful children-a son Ryan and two daughters Megan and Kirsten. I also have two dogs, Bosco, a Cocker/Bichon and Russel, a Puggle. Now I have my dream job working at La Crescent Animal Care with a wonderful staff and fantastic patients and clients! Growing up in Holmen, WI, I always had a passion for the care of animals. I graduated from RCTC in Rochester, MN with an associate degree in applied science for Veterinary Technology and am now a certified veterinary technician. In my spare time I love to spend time outdoors camping, scrapbooking, and enjoying the company of my family pets. Raised right here in La Crescent, my love for animals began with visiting and working on my grandparents farm as a child. I then graduated from Globe University and became certified in 2017. 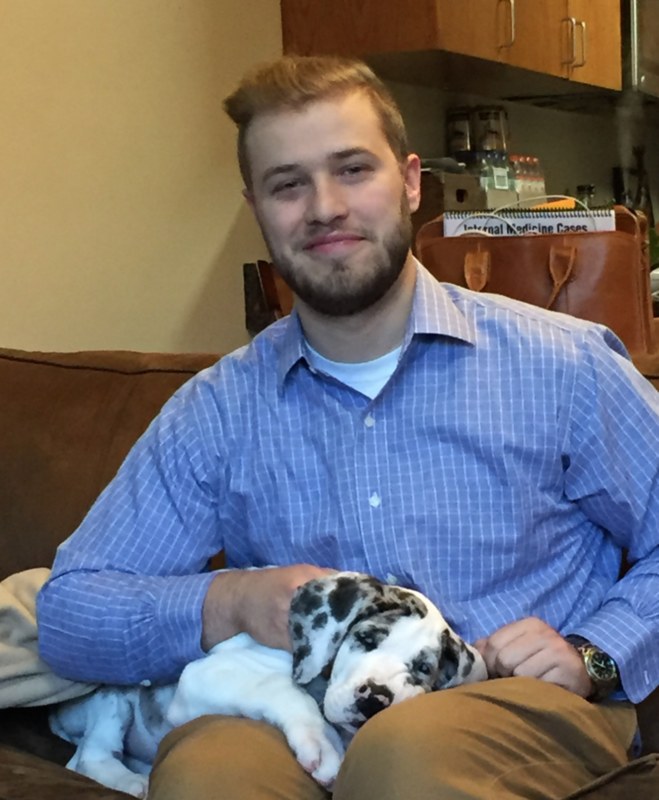 My goal at La Crescent Animal Care is to continue learning and building my skills in dentistry, client communication, and most importantly developing a strong bond with clients and patients. I graduated from MATC in May 1997 with a degree in Veterinary Technology. I love having the opportunity to work with many different species of animals at La Crescent Animal Care, from exotics to cats and dogs. I have a boxer mix named "Logan" and a calico cat named "Miley". Outside of work, I enjoy spending time biking, swimming, gardening and traveling with my husband and three kids. I am a La Crosse native and graduated from Logan High School. I’ve been working actively as a veterinary technician for 18 years. The bond I gain working with animals makes everyday a rewarding experience! I have two dogs, Nosey and Brownie. Nosey is our clinic mascot and comes to work with me every day. I also have three cats, named Teenie, Eenie and Weenie. My husband and I have 2 daughters that adore animals too. I graduated from Globe University in 2016. Currently I have one dog. In my free time, I enjoy being outside and spending time with my friends and family. My hands and heart are full with this career path, and I wouldn’t change it for the world. I was born and raised in Menomonie, WI. 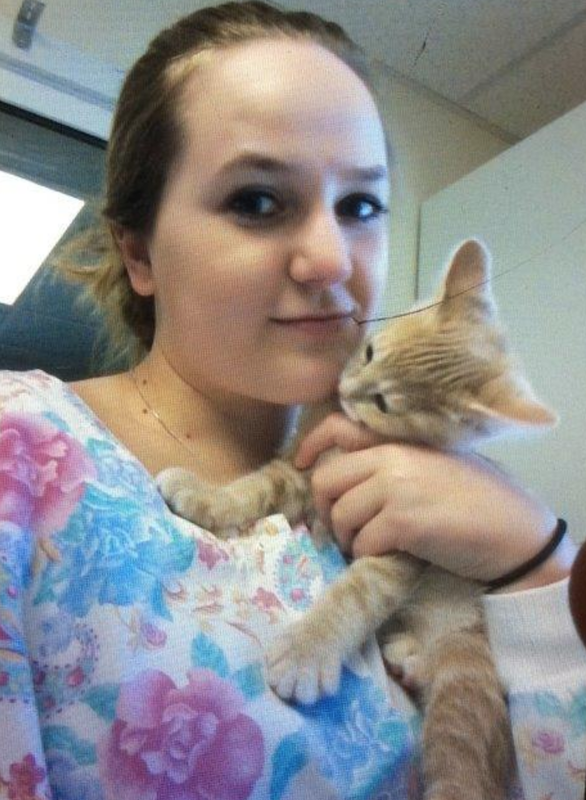 My senior year of high school I started working at the local Humane Society. The seven plus years of working at the Humane Society confirmed that I wanted to work with animals for the rest of my life. 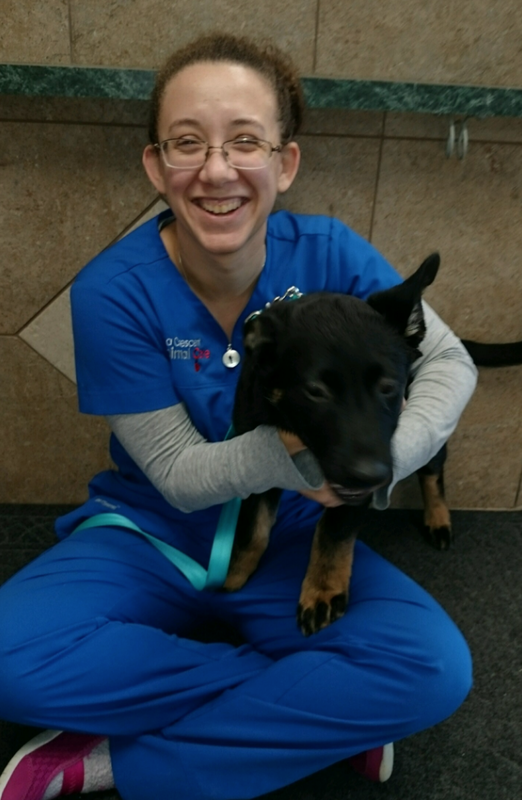 I graduated from Argosy University as a Veterinary Technician in 2015 and started working at a clinic in Eau Claire, WI, while still working part time at the Humane Society. In May of 2017 I married my husband and moved to Onalaska and started my journey with La Crescent Animal Care. I currently have 4 furry children ( 2 dogs and 2 cats ) and our first baby on the way. The sixth of nine children, Jeanne was raised on a dairy farm in northern Wisconsin. 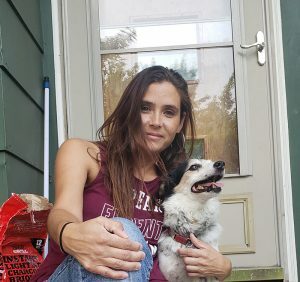 She is the proud mother of two grown children, and is owned by her 13 year old Black Lab, and an assortment of cats, a rabbit, and three horses. 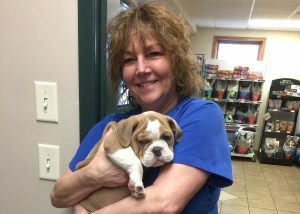 Jeanne has worked in the Veterinary field for over 20 years, and was instrumental in the initial organization and leadership of the Trempealeau County Humane Society. She has been at La Crescent Animal Care for one year and we're happy to have her on our team! I have worked in the Minnesota school system for 25 years, but have always worked at a Veterinary Clinic over the summers and on weekends. I have worked as a groomer and veterinary assistant. I love animals and have 4 dogs and 2 cats at home. I have a son Patrick and a daughter Bridget, and two beautiful granddaughters Josie and Libby. Hello, My name is Victoria (Tory) Bruggeman. I grew up in Brownsville, MN. After high school I met my future husband while attending college at South Dakota State University. We ended up getting married in 2009 and bought a house in a small town near Sioux Falls, SD. I currently have three dogs of my own. A Standard Poodle, Chihuahua and a Cavalier King Charles Spaniel. I have always had a great love for animals, so pursuing a career in pet grooming was an easy choice for me. I have been grooming for over ten years. In the summer of 2015 we had a beautiful daughter named Alorah. Having her made me want to move back to my hometown even more. In the spring of 2018, we decided to relocate back to Brownsville, MN. I am super excited to be back in the area and to be working for a great team at the La Crescent Animal Clinic, where I can build a great clientele once again! Great customer service has always been of the utmost importance to me and I look forward to meeting everyone of my new customers. Kimberly has twenty years of pet grooming experience, and is an International Certified Master Groomer (ICMG) with the International Professional Groomers, Inc. She has been very successful in the competition ring, garnering multiple First Place wins at National Pet Grooming Competitions. As a former Pet Grooming Instructor, Kimberly is a firm believer that all pet groomers should receive a formal education, as well as, continuing education to help meet their clients’ needs. A quote from Kimberly states her commitment to education and excellence, “Every client deserves to look and be treated like a “Best-In-Show” pet while in my care, because they’re more than just a pet, they’re family. Her professional career outside of grooming includes showing and handling English Springer Spaniels. Kimberly has also worked with pet care companies as a spokeswoman, and consultant for product safety and design. An important aspect of her life is the time spent with her husband traveling throughout our great country; but on most days you can find her at the farmer’s market shopping for all the local specialties or curled up in front of the fireplace reading a book. I have been a member of the La Crescent Animal Care team since 2009. I love my job and seeing all of the different animals that we get to work with. I have worked at La Crescent Animal Care for many years. My favorite part of my job is getting to see all of the animals when they come in for appointments.